The Nineteenth Judicial District Commission on Judicial Performance unanimously recommends by a vote of 10-0 that Judge John J. Briggs BE RETAINED. Judge Briggs was appointed to the Weld County Court in December 2010. Judge Briggs graduated from Washington University School of Law in 1993, and went to work for the Kansas Court of Appeals, Central Research staff until 1996. He then worked as a Public Defender in the states of Colorado and Nebraska for six years. He entered private practice joining the law offices of Robert Ray LLC., from December 2004 to 2010. 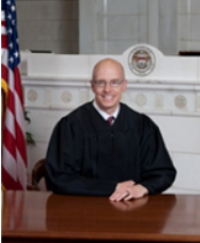 Judge Briggs has held the following positions with the Weld Food Bank, President and Vice President. He has volunteered numerous hours in the recovery after the Windsor tornado and recent flooding. He volunteers in his local schools and is a volunteer judge for the high school for the mock trial competition. The Commission conducted a personal interview, observed Judge Briggs in court, and reviewed opinions he had made, as well as reviewed surveys by attorneys and non-attorneys. Judge Brigg’s docket in County Court includes civil and criminal cases. Of attorneys responding to the survey, 77% recommended retention, 15% not to retain and 8% made no recommendation. Of the non-attorneys responding to the survey, 91% recommended to retain, 4% not to retain and 5% made no recommendation. The overall average grade for Judge Briggs by attorneys was above the average grade for all County Court Judges standing for retention (3.53). In the areas of Case Management, Application and Knowledge of Law, Communication, and Demeanor, Judge Briggs’ ratings exceeded the average ratings of all county judges who were up for review at this time.